Out of the two features that I have introduced to the world of my blog this year, these being Wind Back Wednesdays and Fancy Things Friday, there is one that appears to be flopping in terms of people logging in to read (Wind Back Wednesdays) and one that is usually my most read thing of the week (Fancy Things Friday). It's not that no one is reading the Wednesday memories I'm digging up, but it would appear that there are a lot of people skipping over it. I can't pretend that I don't see the reasons behind this. Truth is, the feature, which had seemed like the most awesome idea to me when I made it up, has been proving to be hella difficult for me each week as I'm really struggling to find things to talk about. As such, the posts have become less interesting than the initial three memories I had to go on when I initially thought it up. Guys, I'm scraping the bottom of the barrel and I know it. Do not worry about that. 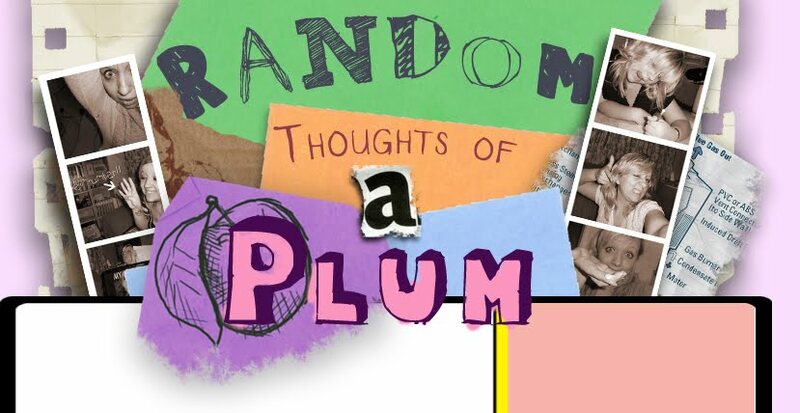 As such, I'm considering making it not so much a weekly thing, but rather a feature that I only put on a Wednesday, should something interesting pop into my head one week. If I did this however, I would like something new to put in its place, and if anyone has an idea, please do let me know. 2. My view ratings for Fancy Thing Fridays probably has more to do with the things I'm fancifying rather than me. I've been finding things fancy recently that have already made it pretty big. 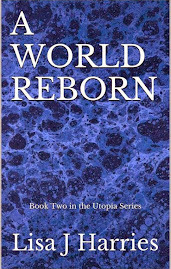 As such, I am just opening myself up to the world of google searches, when people are not so much looking for my blog, but rather for the thing that I am blogging about. This isn't a bad thing, the things I find fancy damn well should be googled, hence the reason for them being fancy, but it would be interesting to see how much is me and how much is the product/thing/person. For that reason, I'm talking today about a thing that I have been obsessed with for the better part of 10 years, and which, as far as I have seen, is not at all popular as it has always been met by others with confusion and general ignorance when I have shown it to them. This thing is a little Japanese puzzle called Hanjie. Heard of it? If you have, I applaud you and welcome you into the elite group of people I know who have heard of it... at the moment it consists of me and the 17 year old version of an old friend who introduced it to me. I don't know if she plays it anymore, but she certainly got me hooked. If you haven't, guys get on board and give this puzzle the genius recognition it deserves, it is 100% pure enjoyment... after the initial year or so it takes you to actually work out how to play it. And this is where I feel it has lost some of the fame it could have had. After almost a decade of doing these puzzles, I pretty much rock. Yup, I'm owning it. I may not be good at maths stuff or knowledge and crap, but when it comes to a really tough Hanjie puzzle, I own that shizzle. However, it has taken me a long time to get the hang of it. I kept at it, because I enjoyed it so much and didn't really have much else going on for me at the time, but there were a lot of wasted attempts involved before I even got close to completing one. Now, I can't watch a single thing on TV without having a Hanjie in front of me as well. That's right, I'm using the classic "women are generally better at multi-tasking" fact to its full potential. I realise so far I haven't really sold the concept, but stay with me, things are about to get crazy. When you are finished with the puzzle, this is what you end up with. With your blank Hanjie puzzle page you have a series of numbers that run across the top of the grid and down the left hand side. Each of these numbers represent a series of squares that should be shaded in. For example, in the empty puzzle picture, the bottom line has the number 30. 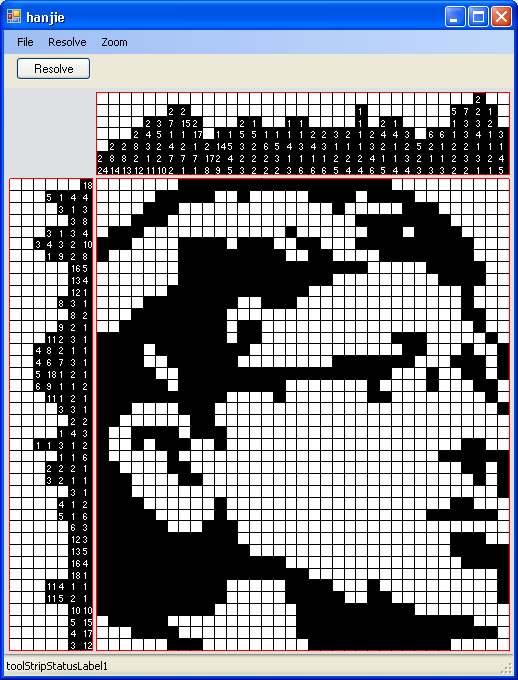 That means that there are 30 squares that need to be shaded in together. The others are left blank. The trick of the puzzle is to work out which ones need to be shaded in. 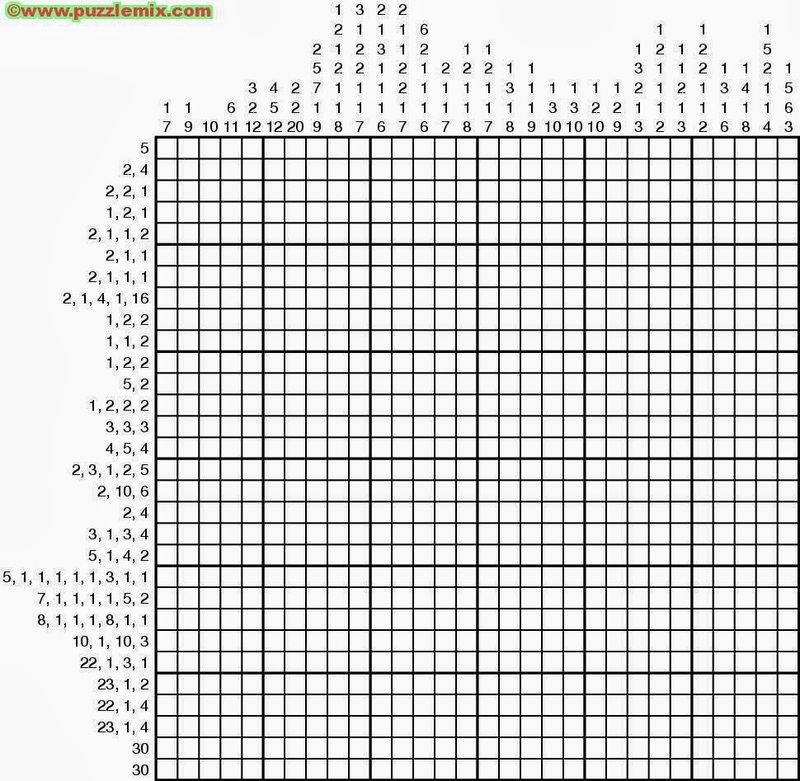 These have to also correspond with the numbers at the top of the grid which shows you how many squares need to be shaded in, in the column below. Are you lost? Because this is usually where people I'm talking to get their glazed over look and paste a smile on their face just to keep me happy... if you're there, I totally understand. It's fine. Just do what I did, which is buy a magazine with small versions of the puzzle, and flit between the puzzle you're doing and the answer page to get the hang of how it works. Guys, it's not only fine to cheat at the learning stage of this puzzle, but it is a necessity. Otherwise, you will find yourself getting headaches and throwing the magazine across the room in a fit of rage... apparently... not that I have any personal experience of this. Once you do get the hang of it however, it becomes the most rewarding thing ever. Not only because you have the excited feeling of accomplishment over understanding something that made no sense to you going in, but also because you then get to make a ridiculous amount of pretty pictures that, dependent on how difficult and big the puzzle is, can actually give you this weird disillusioned feeling of being some form of kick arse artist. Yes, not only have you finished a complicated puzzle, but you have a pretty picture to show for it that you can absolutely insist your parents put up on their fridge door, despite their protests that you didn't actually draw it yourself. Now that I don't live anywhere near my parents fridge door and they've both told me to stop sending them my finished puzzles by recorded delivery because they just throw them away when they get them anyway, thus making it a waste of money, I have taken to putting my finished products on my own proverbial fridge door... a little place I like to call Facebook. Yes, Younger-Brother-Daniel might have been known as the artist in our family up until now, but I reckon I'm definitely beginning to give him a run for his money... mwoah ha ha. Once you get the hang of the smaller Hanjie puzzle, why not try your hand at the above larger ones? These are in A4 and tend to make you feel a little more accomplished at the end because the pictures actually do resemble what the title suggests, rather than some pixelated dumbed down "have to squint and tilt your head whilst using your imagination so hard it begins to hurt" version that the smaller ones have. These ones will also tend to take about 6 hours each to finish... yeeaaah, I love this aspect, especially as it is really hard to find a place that sells the books so it helps that they last longer, however I appreciate that it might not be ideal for those who want a quick puzzle on the go. 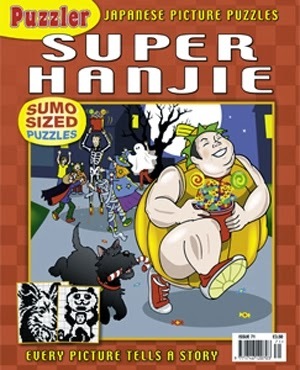 And this is the problem that I have with Hanjie being such a niche puzzle... as it stands, there is only one brand of shops in Britain that sell these puzzles, WH Smiths. And even then, the likelihood of finding them in stock is completely down to luck and only ever possible in the larger stores. This does mean that I have now subscribed to this particular magazine... that way I'm guaranteed a month's worth of fun every month. You may not see the excitement and joy in this as of yet, but give it a year or so of non stop trying to get the hang of the puzzle and you will be right there with me... trust me on that. In terms of buying a copy of this puzzle for yourself, I think the accessibility varies dependent on your country. All people within the UK can find it in any biggish type WH Smith. I'm sure Japan will probably sell it the most. Other than that, might I suggest a quick google for your area? Or just order one in, that's what I do! And it's cheap and fun and awesome. I have no idea as to whether I've successfully sold people on this puzzle. I love it. And if you love a good logic puzzle of the Japanese origin that isn't the over sold Sudoku, then give it a try. I may never be able to hold the general knowledge to complete a crossword puzzle, or the second brain The-Father seems to hold to finish Cryptic Crosswords, but dammit I can certainly colour in squares for 6 hours straight whilst watching sci fi on Netflix and end up with a pretty picture at the end. And so could you. Believe in yourself. It will happen.